With the recent credit crisis and a year of record petrol prices, people are looking at finding ways to cut their costs on fuel. What drives petrol prices or why petrol is more expensive before the weekend and cheaper on Monday? Let's look at some basics. Raw material, processing costs and tax make up most of the price. The rest is distribution costs and retail profit. Short-term changes in prices are caused by local competition between retailers whilst longer-term trends are driven mostly by raw material costs. Daily fluctuations in price are caused by retailers discounting to attract customers. They actually don't make much money from selling petrol – milk, papers, cigarettes and so on are what keep petrol stations going. Australia buys its crude oil requirements in US dollars through the Singapore wholesale market. Changes in the A$-US$ exchange rate will impact fuel prices as will worldwide changes in supply and demand. Our petrol taxes are relatively low compared to the rest of the world – only USA, Canada and Mexico are lower. Many governments have used taxes to raise revenue and force improvements in fuel efficiency. There are things you can do to reduce your spending on petrol. Take advantage of the fuel discounting cycles and buy midweek. To find the best prices in your area look up www.fuelwatch.com.au. Looking after you car and thinking about how you drive makes a difference. Correctly inflated tyres will improve your fuel efficiency. Air conditioners can add up to 20% to fuel consumption. Steady driving uses less fuel than racing and braking. 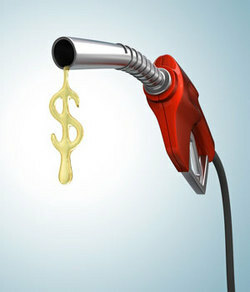 For more information on fuel pricing, check the Australian Institute of Petroleum website at www.aip.com.au. When prices fall, it's easy to get complacent. Good habits and a bit of planning can save you money regardless of the price of petrol.